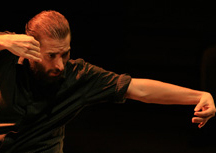 A bold and virtuosic dance artist, Israel Galván makes his first appearance in Vancouver showcasing his unique and innovative approach to flamenco in the work La Edad de Oro. Bringing both great subtlety and explosive rhythmic movement to his work, Galván acknowledges and is faithful to the spirit of flamenco’s long lineage and history, while smashing stereotypes and preconceptions common to the form. Partnering with cantor David Lagos, and guitarist Alfredo Lagos to mine the popular conception of flamenco’s golden age in the late 1800’s through 1930’s, they push away the age to extract only the gold in a performance that is not to be missed.